This was an incident on June 24, 1947, where private pilot Kenneth Arnold spotted a string of nine, shiny, mostly disc-like unidentified flying objects flying past Mount Rainier at then unheard of supersonic speeds that Arnold clocked at a minimum of 1,200 miles an hour. This was the first post-War sighting in the United States that garnered nationwide news coverage and is credited with being the first of the modern era of UFO sightings, including numerous reported sightings over the next two to three weeks. Arnold's description of the objects also led to the press quickly coining the terms "flying saucer" and "flying disc" as popular descriptive terms for UFOs. On June 24, 1947 Arnold was flying from Chehalis, Washington to Washington to Yakima, Washington in a CallAir A-2 on a business trip. He made a brief detour after learning of a $5,000 reward for the discovery of a U.S. Marine Corps C-46 transport airplane that had crashed near Mt. Rainier. The skies were completely clear and there was a mild wind. A few minutes before 3:00 p.m. at about 9,200 feet (2,800 m) in altitude and near Mineral, Washington, he gave up his search and started heading eastward towards Yakima. He saw a bright flashing light, similar to sunlight reflecting from a mirror. Afraid he might be dangerously close to another aircraft, Arnold scanned the skies around him, but all he could see was a DC-4 to his left and behind him, about 15 miles (24 km) away. About 30 seconds after seeing the first flash of light, Arnold saw a series of bright flashes in the distance off to his left, or north of Mt. Rainier, which was then 20 to 25 miles (40 km) away. He thought they might be reflections on his airplane's windows, but a few quick tests (rocking his airplane from side to side, removing his eyeglasses, later rolling down his side window) ruled this out. The reflections came from flying objects. They flew in a long chain, and Arnold for a moment considered they might be a flock of geese, but quickly ruled this out for a number of reasons, including the altitude, bright glint, and obviously very fast speed. He then thought they might be a new type of jet and started looking intently for a tail and was surprised that he couldn't find any. They quickly approached Rainier and then passed in front, usually appearing dark in profile against the bright white snowfield covering Rainier, but occasionally still giving off bright light flashes as they flipped around erratically. Sometimes he said he could see them on edge, when they seemed so thin and flat they were practically invisible. According to Clark Arnold said that one of the objects was rather crescent shaped, while the other eight objects were more circular, but initially Arnold's descriptions were they resembled saucers skipping on water, no mention of them actually looking like saucers. At one point Arnold said they flew behind a subpeak of Rainier and briefly disappeared. Knowing his position and the position of the (unspecified) subpeak, Arnold placed their distance as they flew past Rainier at about 23 miles (37 km). Using a dzus cowling fastener as a gauge to compare the nine objects to the distant DC-4, Arnold estimated their angular size as slightly smaller than the DC-4, about the width between the outer engines (about 60 feet). Arnold also said he realized that the objects would have to be quite large to see any details at that distance and later, after comparing notes with a United Airlines crew that had a similar sighting 10 days later (see below), placed the absolute size as larger than a DC-4 airliner (or greater than 100 feet (30 m) in length). Army Air Force analysts would later estimate 140 to 280 feet (85 m), based on analysis of human visual acuity and other sighting details (such as estimated distance). Arnold said the objects were grouped together, as Ted Bloecher writes, "in a diagonally stepped-down, echelon formation, stretched out over a distance that he later calculated to be five miles". Though moving on a more or less level horizontal plane, Arnold said the objects weaved from side to side ("like the tail of a Chinese kite" as he later stated), darting through the valleys and around the smaller mountain peaks. They would occasionally flip or bank on their edges in unison as they turned or maneuvered causing almost blindingly bright or mirror-like flashes of light. The encounter gave him an "eerie feeling", but Arnold suspected he had seen test flights of a new U.S. military aircraft. As the objects passed Mt Rainer, Arnold turned his plane southward on a more or less parallel course. It was at this point that he opened his side window and began observing the objects unobstructed by any glass that might have produced reflections. The objects did not disappear and continued to move very rapidly southward, continuously moving forward of his position. Curious about their speed, he began to time their rate of passage: he said they moved from Mt. Rainer to Mount Adams where they faded from view, a distance of about 50 miles (80 km), in one minute and forty-two seconds, according to the clock on his instrument panel. When he later had time to do the calculation, the speed was over 1,700 miles per hour (2,700 km/h). This was about three times faster than any manned aircraft in 1947. Not knowing exactly the distance where the objects faded from view, Arnold conservatively and arbitrarily rounded this down to 1,200 miles (1,900 km) an hour, still faster than any known aircraft, which had yet to break the sound barrier. It was this supersonic speed in addition to the unusual saucer or disk description that seemed to capture people's attention. Arnold's sighting was partly corroborated by a prospector named Fred Johnson on Mt. 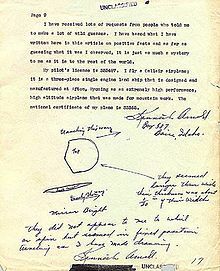 Adams, who wrote AAF intelligence that he saw six of the objects on June 24 at about the same time as Arnold, which he viewed through a small telescope. He said they were "round" and tapered "sharply to a point in the head and in an oval shape." He also noted that the objects seemed to disturb his compass. An evaluation of the witness by AAF intelligence found him to be credible. Ironically, Johnson's report was listed as the first unexplained UFO report in Air Force files, while Arnold's was dismissed as a mirage, yet Johnson seemed to be describing a continuation of the same event as Arnold. The Portland Oregon Journal reported on July 4 receiving a letter from an L. G. Bernier of Richmond, Washington (about 110 miles (180 km) east of Mt. Adams and 140 miles (230 km) southeast of Mt. Rainier). Bernier wrote that he saw three of the strange objects over Richland flying "almost edgewise" toward Mt. Rainier about one half hour before Arnold. Bernier thought the three were part of a larger formation. He indicated they were traveling at high speed: "I have seen a P-38 appear seemingly on one horizon and then gone to the opposite horizon in no time at all, but these disks certainly were traveling faster than any P-38. [Maximum speed of a P-38 was about 440 miles an hour.] No doubt Mr. Arnold saw them just a few minutes or seconds later, according to their speed." The previous day, Bernier had also spoken to his local newspaper, the Richland Washington Villager, and was among the first witnesses to suggest extraterrestrial origins: "I believe it may be a visitor from another planet." About 60 miles (97 km) west-northwest of Richland in Yakima, Washington, a woman named Ethel Wheelhouse likewise reported sighting several flying discs moving at fantastic speeds at around the same time as Arnold's sighting. Arnold landed in Yakima at about 4.00 p.m., and quickly told friend and airport general manager Al Baxter the amazing story, and before long, the entire airport staff knew of Arnold's claims. He discussed the story with the staff, and later wrote that Baxter didn't believe him. Arnold flew on to an air show Pendleton, Oregon, not knowing that somebody in Yakima had phoned in ahead to say that Arnold had seen some strange new aircraft. It was at this time that Arnold studied his maps, determined the distance between Mt. Rainier and Mt. Adams, and calculated the rather astonishing speed. He told a number of pilot friends, and wrote in his account to AAF intelligence that they did not scoff or laugh. Instead they suggested that maybe he had seen guided missiles or something new, though Arnold felt this explanation to be inadequate. He also wrote that some former Army pilots told him that they had been briefed before going into combat "that they might see objects of similar shape and design as I described and assured me that I wasn't dreaming or going crazy." Arnold had the makings of a reliable witness. He was a respected businessman and experienced pilot ... and seemed to be neither exaggerating what he had seen, nor adding sensational details to his report. He also gave the impression of being a careful observer ... These details impressed the newspapermen who interviewed him and lent credibility to his report. Arnold would soon complain about the effects of the publicity on his life. On June 27 he was reported saying, "I haven't had a moment of peace since I first told the story." He then said a preacher had called and told him that the objects he saw were "harbingers of doomsday" and that the preacher was preparing his congregation "for the end of the world." But that wasn't half as bad as an encounter he had with a woman in a Pendleton cafe who looked at him and dashed out shrieking, "There's the man who saw the men from Mars." She ran out "sobbing she would have to do something for the children" Arnold was reported saying "with a shudder". He then added that, "This whole thing has gotten out of hand. I want to talk to the FBI or someone. Half the people look at me as a combination of Einstein, Flash Gordon and screwball. I wonder what my wife back in Idaho thinks." On July 7, 1947, two stories came out where Arnold again was raising the topic of possible extraterrestrial origins, both as his opinion and those who had written to him. In an Associated Press story, Arnold said he had received quantities of fan mail eager to help solve the mystery, none of it calling him a "screwball". Like the earlier doomsday preacher Arnold spoke of, many of the writers placed a religious interpretation on his sighting. But others, he said, "suggested the discs were visitations from another planet." Arnold added he had purchased a movie camera, which he would now take with him on every flight, hoping to obtain photographic proof of what he had seen. "Arnold, in pointing to the possibility of these discs being from another world, said, regardless of their origin, they apparently were traveling to some reachable destination. Whoever controlled them, he said, obviously wasn’t trying to hurt anyone. …He said discs were making turns so abruptly in rounding peaks that it would have been impossible for human pilots inside survived the pressure. So, he too thinks they are controlled from elsewhere, regardless of whether it’s from Mars, Venus, or our own planet." In the weeks that followed Arnold's June, 1947 story, at least several hundred reports of similar sightings flooded in from the U.S. and around the world — most of which described saucer-shaped objects. A sighting by a United Airlines crew of another nine, disk-like objects over Idaho on July 4 probably garnered more newspaper coverage than Arnold's original sighting, and opened the floodgates of media coverage in the days to follow. "It is the present opinion of the interviewer that Mr. Arnold actually saw what he stated he saw. It is difficult to believe that a man of [his] character and apparent integrity would state that he saw objects and write up a report to the extent that he did if he did not see them." Despite this, the Army Air Force's formal public conclusion was that Arnold had seen a mirage.